W e can’t wait for this year’s NADA Convention, which is being held Thursday, January 24th – Sunday, January 27th at the Moscone Center in San Francisco, California. 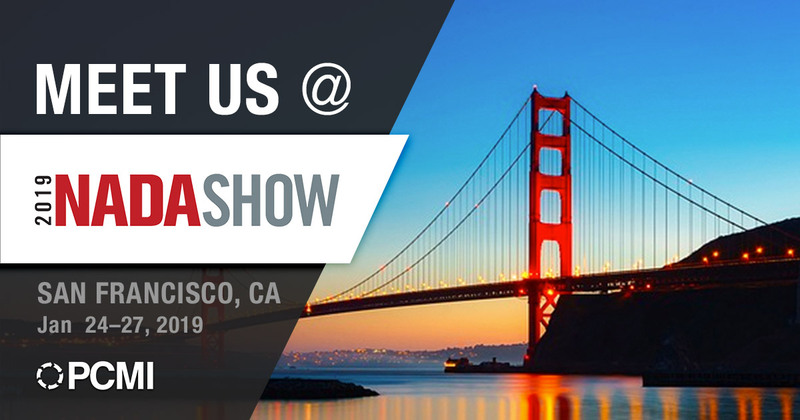 NADA is one of the highest acclaimed shows in the automotive industry and our team is eager to be attending once again. PCMI’s President & CEO – Mark Nagelvoort, Marketing Manager – Laura Kotz and Business Development Manager – Sean Mangan, will be walking the showroom floor, sharing innovative knowledge with peers, and networking with industry leaders. With the conference bringing together more than 500 manufacturers and suppliers of the top products and modern technologies, the show is a great place to connect with dealers and industry experts. Our PCMI team always looks forward to discussing and demonstrating how our administration platform, PCRS, can help automate the lifecycle of F&I products, Service Contracts, and Extended Warranties. Schedule your meeting with Mark, Laura and Sean in San Fran to learn more about PCRS or tell us about your current technology challenges! Want to know why our customers trust the uptime and reliability of PCRS? In 2012, we went the extra mile to partner with Rackspace, the leader in managed hosting services, who built us a customized infrastructure to keep our software running smoothly and securely. Rackspace provides PCMI with white-glove intensive support, which ensures our team is able to meet the data compliance and data security needs of our customers. We can also focus and dedicate our time to working on the continued enhancement of the PCRS platform and providing the most comprehensive software package for the administration of F&I Products, Service Contracts, and Extended Warranties.